French President Emmanuel Macron has visited a regional government headquarters that was torched by protesters and promising firm punishment for perpetrators. Macron hasn’t spoken publicly in days about nationwide protests over fuel tax rises that have prompted violence in multiple sites, including the worst rioting in Paris in decades. One of the most dramatic incidents outside Paris was in Puy-en-Velay in southern France, where flames shot out from the prefecture, or administration headquarters for the province. Macron is visiting the prefecture Tuesday. His office said he wanted to “personally and directly show his respect and support” for the staff after the fire Saturday. His office said Macron also is praising police who fought for several hours to contain around 150 protesters inside the courtyard and around the perimeter of the prefecture building. French lawmakers from all political parties have paid tribute to police forces with a rare unanimity, giving them a standing ovation in the lower house of parliament after Prime Minister Edouard Philippe praised their professionalism in Saturday’s riot in Paris. The prime minister, speaking in the National Assembly, fielded multiple questions about the fuel tax – and in his first response, he mentioned the rioting and the bravery of police, prompting lawmakers from various parties to stand and applaud. Philippe has been under fire from opposition lawmakers after his decision to suspend fuel tax and utility price hikes in an effort to ease tensions in the country. High school students have set fires in front of their Marseille school as students across France hold scattered demonstrations as part of a nationwide protest movement. Images captured on video show crowds gathered around flames spewing out black smoke outside the Victor Hugo School in Marseille. Helmeted riot police later moved in, appearing to disperse the crowd with tear gas. It was one of about 100 high schools around the country blocked or otherwise disrupted by student protests Tuesday, according to the Education Ministry. Many are protesting a new university application system. 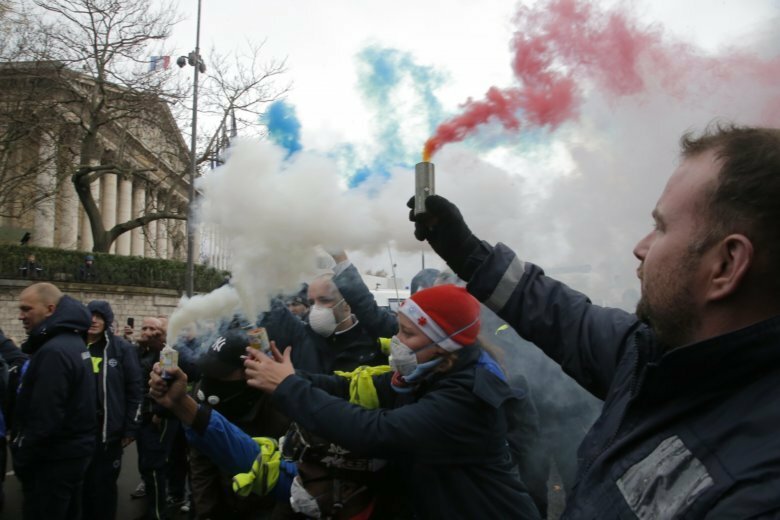 President Emmanuel Macron’s government ceded to protesters Tuesday and agreed to suspend the fuel tax hikes that prompted the original nationwide protests. But the movement has grown to encompass broader anger at the government — and unrelated grievances like the university applications. The French soccer league says it has postponed Saturday’s match between Paris Saint-Germain and Montpellier amid expected anti-government protests. The match at the Parc des Princes stadium has been called off because police say they fear they won’t have enough forces available to guarantee fans’ security because of the protests likely to take place in the French capital that day.